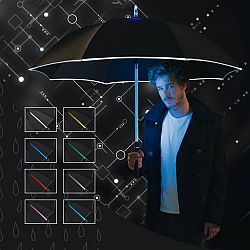 The automatic regular umbrella Fare®-Switch features a variable LED lamp on the shaft, which can be switched to a selection of seven colours or shines in alternating colours at the push of a button at two different speeds. The safety aspect of the “lightsaber umbrella” is enhanced by the all-round reflective piping (in acc. with EN ISO 20471), which prevents the user from being overlooked even when the lamp is not switched on. The umbrella defies strong gusts of winds thanks to its windproof system. The well-concealed high-power battery can be recharged via a micro USB connection that is hidden behind a rubber cover. The LEDs shine for up to 48 hours after being charged for just two hours using the supplied cable. The cover made of recycled plastic is Oeko-Tex® Standard 100-certified and the production site complies with the stipulations of the BSCI (Business Social Compliance Initiative). The panels and the closing strap of the umbrella that was distinguished in the category Premium Products are individually customisable. This allows the CI look of promoting companies to be ideally combined with the individual preferences of the target group, allowing the latter to present themselves in the right light to suit their own tastes by choosing the respective colour.